Estate planning can help you create a strategy for managing your assets, both during your lifetime and after you pass away. That includes determining what will happen to your physical property, as well as your investments and other financial accounts. It can also, however, cover more than that if you have pets. 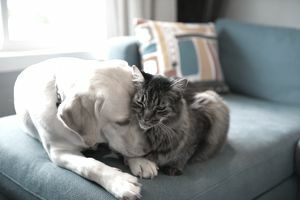 A pet trust is a legal arrangement that specifies how your animal companions would be cared for and taken care of financially if you pass away, or if you become ill or disabled and can no longer take care of them yourself. With the exception of Minnesota, every state and the District of Columbia have laws governing the creation and use of pet trusts. Understanding how pet trusts work and what the benefits are can help you decide whether you need to include one in your estate plan. When you set up a trust, you as the grantor have the authority to specify exactly how you want any assets in the trust to be handled, on behalf of yourself and the trust's beneficiaries. A pet trust operates on a similar principle. You could also use a pet trust to specify end of life care treatment for pets, and any burial or cremation arrangements that you'd prefer once your pet passes away. Generally, a pet trust can be established to remain in place for the pet's life expectancy. Some states do, however, cap how long a pet trust can continue. In several states, the limit is 21 years. In terms of the types of pets that can be covered by a pet trust, the list includes the pets you'd expect: cats, dogs, birds, turtles, snakes, lizards, hamsters, and similar small animals. But, you could also set up a pet trust for larger animals, such as a horse. Creating a pet trust is similar to creating any other type of trust. An estate planning attorney can help with drafting the trust document itself. You'd need to identify the person you want to serve as trustee, and any successor trustees if you're worried about your pet outliving them. That last one is important if you don't want any leftover funds to go to waste. You could have the money split up among the beneficiaries to your will or donate it to charity. Your pet trust should include a contingency plan for those scenarios. Think about when the pet trust will take effect. You may not anticipate becoming permanently incapacitated but it may be wise to have your pet trust plan for that possibility. It's wise to ensure that your pet trust clearly identifies your pet so that no one is able to abuse its terms and access trust funds fraudulently. A good way to do this is to have your pet microchipped if you haven't done so already and record the chip number in the pet trust document. Be sure to include photos of your pet and a physical description. With a pet trust, it's okay to be as specific as possible about how you'd like your pet to be taken care of. For example, there may be certain foods that should be avoided or a specific brand of food your pet prefers. You may have gotten into regular routines or habits with your pets, such as taking them for walks in a particular spot, that you'd like the caregiver to continue to observe. All of these things can be included in a pet trust. An estate planning attorney can help you shape your plan to cover every situation that you think is relevant. If you're setting up a smaller pet trust, you could also do it yourself by creating your trust online. Just make sure that your estate planning attorney, the trustee and your pet's designated caregiver receive a copy so that your wishes can be followed.